Email marketing strategies and tactics change every year. To know what does and doesn’t work, it’s a good idea to keep an eye on the trends and average results for your industry. 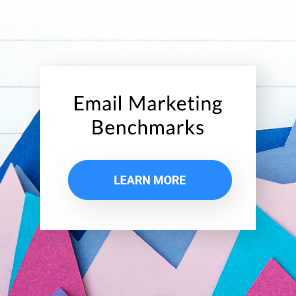 To make that easier, we’ve once again updated our Email Marketing Benchmarks report. 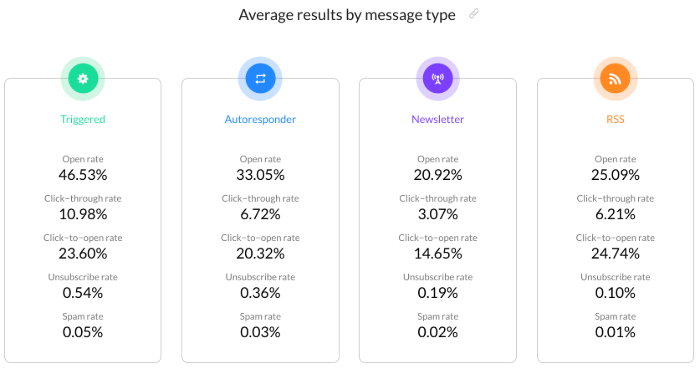 So you can track email opens, click-through rates, and other essential email marketing metrics. This time, we analyzed over four billion emails sent by our customers between July and December 2018. Below, you’ll see a snapshot of the key findings. Prefer to dive into the data right away? Feel free to explore the Email Marketing Benchmarks report. Now let’s take a look at six key email marketing insights – and what they mean for your business. Still think email marketing is simply sending newsletters and flash sale campaigns? Think again! Once again, we found automated emails outperform manual ones. On average, automated emails (what we call triggered emails) generated a 46.53% email open rate and a 10.98% click-through rate (CTR). Autoresponders (also known as drip emails) were just as impressive – with an average 33.05% open rate, and 6.72% CTR. Welcome emails also saw impressive engagement rates – with an average 84.22% open rate, 25.91% CTR, and 30.8% click-to-open rate. Imagine how high your CTR could go if your welcome email had a strong incentive (like a discount code) to click through to your website? On average, recipients will open more than four out of ten automated emails, and click through to one in 10. 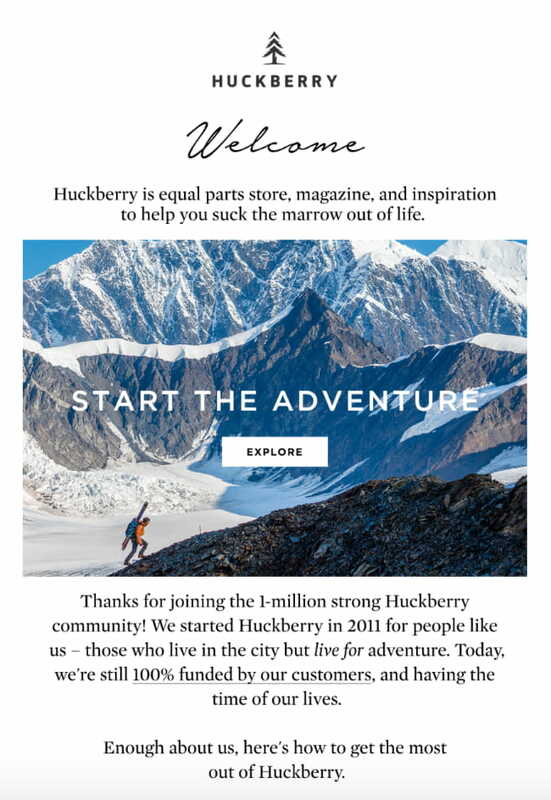 And engagement rates are even higher when you send specific campaigns like welcome emails. Now compare these results to your other marketing channels. That’s why across all online marketing channels, email marketing offers some of the biggest bang for your buck. Email legislation changes are enough to make even the savviest marketers tremble. Last year, it was GDPR that shook the email marketing industry. This year will probably be no different, as the new CCPA (California Consumer Privacy Act) comes into force. But now that the dust has settled, how did GDPR affect industry results? It turns out, after the initial chaos and flood of GDPR-related emails, the results haven’t changed all that much. For European customers, who have been most affected, the average email open and click through rates have even increased slightly – from 26.77% to 26.91%, and from 4.58% to 4.61% respectively. At the same time, the average global email results have dipped – but only by less than a percentage point, compared to our Q2 2018 data. There’s no need to worry about the new regulations impacting your campaign performance. If you stick to email marketing best practices, you’ll do well. Want to get ready for the CCPA? Check out our article below, plus our copywriting hints based on GDPR emails. It’s an obvious insight, but now we have the data to back it up. 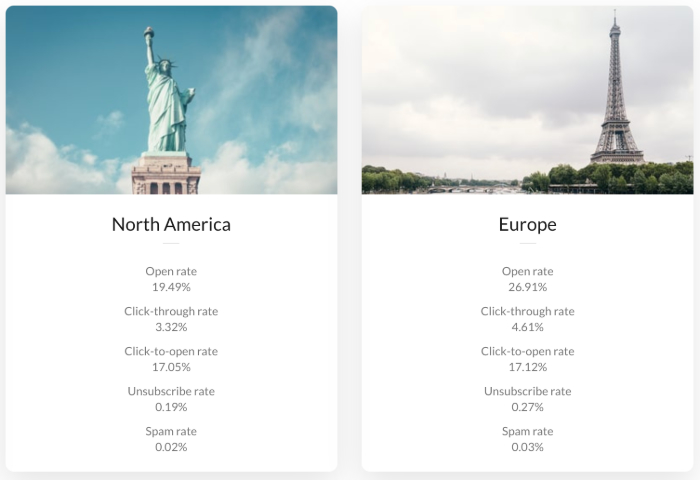 Take a look at the average open and click-through rates by industry report. The industries with the highest average results are also the ones we tend to care the most about – or are most likely to respond to. The restaurants and food, non-profit, and publishing industries scored an average open rate above 33%, and between a 3.89% and 8.86% CTR. Why would industries like travel or real estate score lower? Chances are, it’s because we only tend to go on vacation once or twice a year (52.5% of SMB marketers took their last vacation over a year ago). And we rent or buy property even less often. How can you beat the industry benchmarks? Focus on creating engaging content, and pinpoint the best way to deliver your emails. We’ve already looked at how marketing automation can boost your engagement rates, so now let’s turn to videos and images. 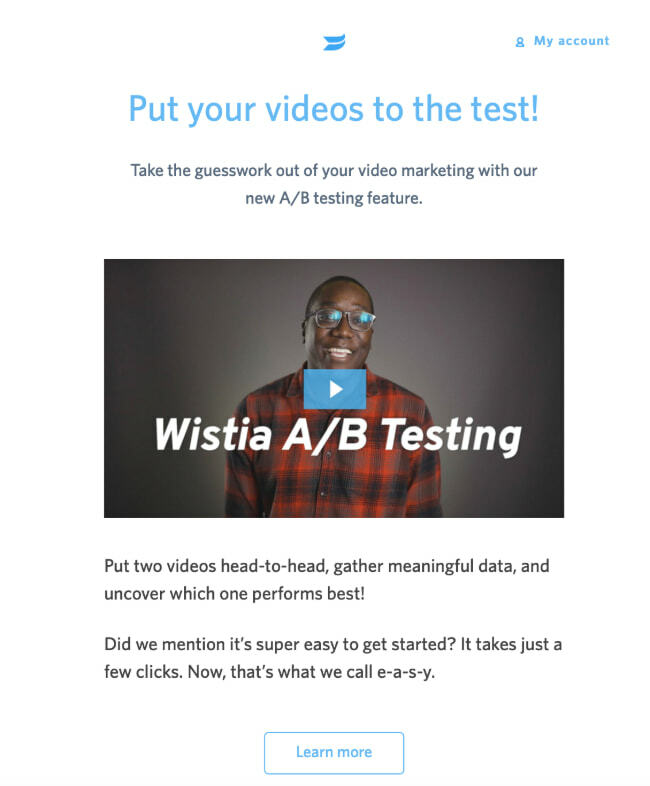 Our data shows emails with video content beat the industry averages for opens and clicks. Campaigns linking to YouTube (the most popular video hosting platform) observe a 29.6% average email open rate and a 6.62% click through rate. Also, campaigns with images outperformed text-only emails with an email open rate of 25.16% compared to 17.8%, and a click-through rate of 4.11% compared to 2.87%. Keep your email program versatile. Use marketing automation to send your emails at the best time and make them relevant. Try more engaging content formats like videos, graphics (e.g. GIFs or interactive content), and personalization. Use these email tactics to enhance your current email marketing program, but remember newsletters or broadcasts also deliver a lot of value – and probably generate a significant portion of your sales revenue, too. What’s the email marketer’s biggest fear (other than legislative changes, of course)? We’ve always said email list quality beats the quantity. But it’s tricky convincing marketers to trim their lists. That’s probably why in Q2 we saw marketers importing single opt-in lists, and unanimously dropping the double opt-in. They seemed afraid to lose some of their lists, if they didn’t reach out to them before GDPR kicked in. Thankfully, the use of double opt-in has picked up again in Q3-Q4. And as you can see in the report, most of the industries using confirmed opt-in tend to have the highest average open and click through rates, too. Now let’s look at a slightly different set of data: the average email marketing results by list size. From the following table, you can clearly see marketers with smaller lists tend to drive higher engagement (in terms of average email open rates and click through rates), than those with larger databases. Why? It could be because those marketers know their subscribers better, and so can engage them more effectively. Shouldn’t marketers will larger lists have more insight into the email tactics that get the best results? My experience running email campaigns suggests it’s easier to handle smaller email lists. When you know your subscribers and their preferences, it’s easy to generate high rates. But the challenge isn’t necessarily about knowing their needs and wants. It could be that running large-scale personalized email campaigns (often a hard and time-consuming task), stops you from achieving better results. 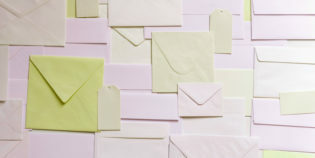 Whatever the case, try personalizing email marketing campaigns whenever relevant – and focus on list quality, not size. Don’t be afraid to remove your inactive subscribers. Recipients who don’t open your emails and click the links are a deadweight that will affect your email deliverability. Try retargeting or reactivating them first, but don’t worry if you have to unsubscribe some of them. 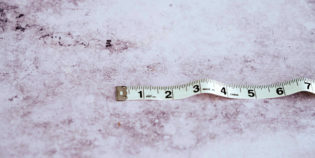 Marketers with smaller lists tend to beat the industry averages, and so can you. Start by segmenting out the inactives for your next email campaign. You’ll then see you can generate more conversions with fewer email addresses. Marketers always want to know the best day and time to send their campaigns. But as with any other marketing channel, it depends. As you can see in the below chart, there are big differences in the send time. But the day doesn’t matter as much – except for weekends! There’s only around a 0.6 percentage point difference between the best five days. So if you don’t send emails on the weekend – when both competition and average results are lower – then any other day should work. If weekends aren’t as busy, it could be an opportunity to stand out in the inbox. While that won’t work for most, some marketers and niches could get great results. Picking the best send time and day may seem tricky – if you do it manually. But with tools like Perfect Timing – which can automatically adjust the timing of your sends – it’s simple. Prefer to do it yourself? Experiment until you find the best time – and then stick to it. If your content is engaging, recipients will routinely check their email inbox for a new message – especially if you let them know on your website and other communications when they can expect them. When should you follow up and retarget your email recipients? It depends how time-sensitive your campaign is. On average, 51.32% of your email messages will be opened within the first seven hours of the send. And you’ll see 51.21% of all clicks within the first four hours. That means the people who are most likely to engage with your content will be the first to do it. In the first 24 hours after your send, you should see 72.57% of all message opens and 80.41% of all click throughs. Choose the timing of your retargeting campaigns strategically. If you switch them up too quickly, you might burn your budget – because recipients could have converted without even seeing the ad. At the same time, it’s probably unwise to wait another day to start the campaign, since the odds of subscribers opening your email campaign and taking action decreases with every additional hour. Email marketing is always evolving, so it’s worth keeping an eye on the latest trends and developments. 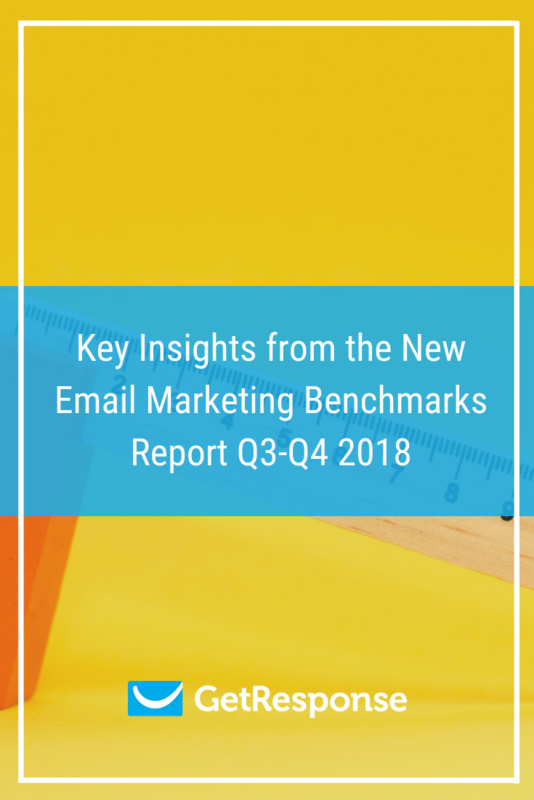 Come back to this article, as we’ll keep adding new insights from our email marketing benchmarks report. To stay up to speed with your marketing, dive into the report and compare your results to others in your industry. So you can make the best decisions for your campaigns. You can find many more reports, tutorials and guides in GetResponse Resources. Have a question – or need feedback? Just leave a comment below.